Turkish police raided the homes of and arrested 72 militant supporters of Istanbul’s top clubs – Besiktas JK, Fenerbahce FC and Galatasaray SK -- after a derby between Besiktas and Galatasary was abandoned because fans invade the pitch. Penalizing Besiktas, the Turkish Football Federation (TFF) ordered the club to play its next four games behind closed doors. Critics of Prime Minister Recep Tayyip Erdogan suspect that his ruling Justice and Development Party (AKP) engineered the incident in a bid to further repress Besiktas’ popular militant fan group, Carsi that played a key role in mass anti-government protests earlier this year. They point to the fact security was lax at the match and that a youth leader of the AKP boasted on Facebook how he had obtained a free ticket to the Besiktas Galatasary derby and was one of the first to invade the pitch. Turkish journalist Mehmet Baransu moreover documented links between 1453 Kartallari (1453 Eagles), a rival conservative Besiktas support group named in commemoration of the year that Ottoman Sultan Fatih the Conqueror drove the Byzantines out of Constantinople, and the AKP. 1453 members reportedly shouted ‘God is Great’ and attacked Carsi supporters during the pitch invasion. The incident has strengthened the government’s hands in discussion with world soccer governor FIFA and European soccer body UEFA over the replacement of private security companies with regular police in stadia. FIFA and UEFA as of matter of principle favor a low key police presence in stadia. The move is part of an effort by Mr. Erdogan to gain control of and depoliticize Turkish soccer and criminalize fan groups in response to the key role they played in mass anti-government protests in June. Carsi lead the unification of Istanbul’s rival fan groups who constituted the front line in confrontations with the police. The government has since banned the chanting of political slogans during matches and has said it was monitoring the communications of militant fans. It further is enforcing Breathalyzer tests at matches and demanding that clubs oblige spectators to sign a statement pledging to abide by the ban before they enter a stadium. Fans have defied the ban by chanting during matches “Everywhere is Taksim, everywhere is resistance," a reference to Istanbul’s iconic Taksim Square, which was the focal point of the protests sparked by plans to turn Gezi Park which abuts the square into a shopping mall. Strengthening the government’s campaign, Besiktas president Fikret Orman criticized the performance of a private security firm hired for ten matches in Istanbul’s Ataturk Olympic Stadium because the club’s own facility is under renovation. “Private security does not run away from the fans, they chase them. What we witnessed amounted to a comedy,” Mr. Orman said. He said that fans had entered the stadium without tickets. Up to 10,000 were believed to have entered the already packed stadium illegally. Sports and youth ministry official Mehmet Baykan said “three entry points were broken into, the power supply to the turnstiles and eight ticket readers were sabotaged. 65 people have been caught with equipment which could have been used to cut the cables." Aware that the protests had reduced Istanbul’s chance of winning the hosting of the 2020 Olympic Games despite long being a frontrunner, government officials prepared the ground for blaming the activists for the Turkish capital’s loss. The protests were a major reason why the International Olympic Committee awarded the tournament earlier this month to Tokyo. Turkish EU minister Egemen Bagis warned that “those who protested at Taksim's Gezi Park tried twice to drop Istanbul’s candidacy off the candidates list, but they failed. If Istanbul loses, it will be because of them.’’ Mr. Bagis’ comment was in response the anti-government protests and a report by Turkish activists, architects and urban planners calling on the IOC not to award the games to Istanbul. “Prosecutors and courts continue to use terrorism laws to prosecute and prolong incarceration of thousands of Kurdish political activists, human rights defenders, students, journalists and trade unionists… Free speech and media remain restricted and there have been serious violations of fair trial rights. Great obstacles remain in securing justice for victims of abuses by police, military and state officials. … Press members are fired, contracts of academicians who supported Gezi are not renewed, film stars are searched for narcotics, and students are arbitrarily detained… The powers of the Chambers of Engineers and Architects were curbed. This was a reprisal for their role” in the protests the report said. The report noted that police had used tear gas and water cannons earlier this year during protests at the opening of the Mediterranean Games in Mersin in southeastern Turkey. It asserted that 80 percent of the tickets for the event were awarded to government loyalists rather than to the public to prevent potential protests against Mr. Erdogan who was scheduled to attend the opening. Mr. Erdogan was booed during the 2010 World Basketball Championship finals in Istanbul and the 2011 opening of the Turk Telekom Arena stadium in the Turkish capital. In a similar development, Egyptian officials are discussing how to deal with the ultras, militant soccer fans who played a key role in the toppling in 2011 of President Hosni Mubarak as well as in post-Mubarak protests against the military. State-owned Al Ahram newspaper, long a mouthpiece for the government, recently asked: “Will the Ultras be shown the red card after crossing the red line? Are they digging their own grave? … Football Ultras of soccer powerhouse Egyptian clubs Ahli and Zamalek have become a dangerous phenomenon… These days the Ultras are a symbol of destruction, attacking the opposition and sometimes their own kind,” the paper said. The paper’s focus on the Ultras follows a series of incidents in which supporters of storied Cairo clubs Al Ahli SC and Al Zamalek SC attacked their clubs and players, demanding resignation of company officials. Zamalek chairman Mamdouh Abbas rejected the calls for him to step down, saying that he would only leave his post if club members adopted a motion of confidence, not in response to the “terror of the Ultras”. Abbas urged the military-backed government to take action against the Ultras White Knights (UWK), the militant Zamalek support group, whom he denounced as sports terrorists. Thousands of Zamalek fans last week buried one of their members killed by security forces while trying to storm the club’s headquarters. 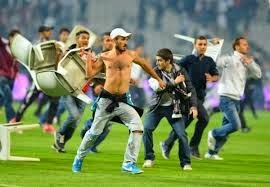 The attempted storming occurred after Zamalek lost an African Championship match to its rival Al Ahli. ”The safe exit of the club’s board of directors after the blood of fans has been shed became impossible,” the UWK said in a statement. At the same time relations deteriorated between Ultras Ahlawy, the Al Ahli support group, and players who rejected conciliatory gestures by the fans. Relations have long been strained between the ultras and players because the militants see them as mercenaries who play for the highest-paying club and resent the fact that they largely remained at best aloof during the anti-Mubarak protests because of the perks the regime granted them. Five Al Ahli players - Ahmed Fathi, Sherif Ikrami, Abdallah Al-Said, Shehab Ahmed and Sherif Abdel-Fadil —recently launched a campaign against the ultras following failed attempts in the past to moderate fan militancy. Relations improved briefly last year after 74 Ahli supporters died in a politically-loaded brawl in the stadium of Port Said. The players’ current campaign portrays the ultras as a threat to their safety and security. The players as well as club officials charge that the ultras’ militancy is hurting them economically at a time that clubs are struggling financially as a result of reduced sponsorship, advertising and ticket sales because league matches have been suspended for much of the almost three years since the anti-Mubarak protests erupted. Professional soccer matches are scheduled to resume in October. Major General Talaat Tantawi, a retired military officer-turned security consultant, charged that the ultras much like their counterparts in Argentina were being manipulated by groups seeking to exploit their popularity. “It is so easy to penetrate these groups and make use of their enthusiasm and youth. They have become easy targets to achieve political goals and to distract them from focusing on their main vision and mission which was supporting sports. Others joined in and became Ultras and are acting as we see now,” Mr. Tantawi said ignoring the fact that the ultras were politicized and steeled in years of confrontations with security forces during the Mubarak era. Controversy over conditions for unskilled and semi-skilled workers in Qatar involved in the construction of World Cup-related infrastructure as well as for flight attendants of Qatar Airways, the 2022 tournament’s likely official carrier, has moved center stage as world soccer body FIFA prepares to debate next week the Gulf state’s hosting of the 2022 soccer tournament. FIFA’s focus is on whether to move the tournament from summer to winter because of Qatar’s harsh summer temperatures that can exceed 40 degrees Celsius. FIFA however will find it difficult to maintain a narrow concern for the welfare of players with no regard to the army of workers involved in constructing billions of dollars in World Cup-related infrastructure. Beyond reputational damage, the debate over workers’ rights and conditions increases the risk of FIFA being pushed to entertain depriving Qatar of its hosting rights, a move that would be perceived by much of the Muslim world as anti-Arab and anti-Muslim. International trade unions have for the past three years threatened a boycott of the World Cup if Qatar failed to improve labor conditions and accept workers’ rights to form independent trade unions and collectively bargain. The issue has taken on added urgency with a report in The Guardian that asserts that 44 workers had died in work-related incidents between June 4 and August 8 and that workers had not been paid, had their passports confiscated by employers, been denied access to free drinking water in the desert heat, and that 30 Nepalese had sought refuge at their embassy in Doha to escape the brutal labor conditions. Adding to Qatar’s problems, the International Transport Workers’ Federation (ITWF) lambasted this week Qatar Airways, the country’s national carrier, as well as United Arab Emirates carriers Emirates and Ettihad for prohibiting employees from organizing and demanding better working conditions. ITWF said it would lobby the International Civil Aviation Organization (ICAO), which is meeting in Canada to take action against the Gulf carriers. The union objects to stipulations in Qatar Airways contracts that oblige employees to obtain company permission before changing their marital status and entitle it to fire women employees as soon as they become aware of a pregnancy. Qatar Airways was last year the target of an online call for a boycott by hundreds of Qataris who objected to its employment policies as well as the fact that it operates a shop in Doha that sells alcohol and pork to foreigners. Qatar has responded to international criticism of its labor conditions by seeking to improve working and living conditions, including stricter enforcement of timely payment of wages, limiting the number of workers permitted to live in one room, planning a city for foreign workers who account for 94 percent of the Qatari workforce and enhancing leisure opportunities, including the creation of a soccer league for foreign workers. The Qatar 2022 Supreme Committee that is responsible for organizing the World Cup issued a Workers’ Charter earlier this year that pledged to meet international standards with the exception of the right to independent trade unions and collective bargaining. Qatar Foundation, the institution that funds educational and social projects, is working on a similar charter. It is also looking at streamlining recruitment to cut out middlemen and agents that charge onerous rates and are responsible for workers’ huge debt burden. Qatari executives note that one offset of the awarding of the World Cup is the fact that workers’ rights and working conditions are on the table and that steps are being taken to address the situation. “While construction on work relating directly to the 2022 FIFA World Cup in Qatar has not yet commenced, we have always believed that hosting the 2022 FIFA World Cup in Qatar could be the catalyst for positive change, particularly for accelerating human and social development in Qatar,” the 2022 committee said. The committee said the government was investigating companies identified in The Guardian report. Qatar has so far however refrained from steps to abolish the onerous Kafala or sponsorship system that makes employees virtually beholden to their employers a step that could convince trade unions and human rights activists that it is serious about reform. The Guardian report signals that on many of the issues such as timely payment, return of passports after completion of immigration procedures and access to water, Qatar is lagging in enforcement rather than in legislation and regulation. The unanswered question is why Qatar has failed to tackle the Kafala system head on and allowed it to fester. 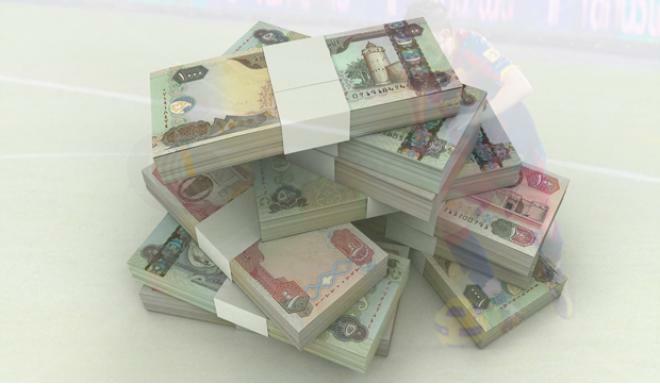 Writing in Open Democracy, Michael Stephens, a researcher at the Royal United Services Institute (RUSI) Qatar, noted that a majority of Qataris acknowledge that their country’s labor system is in desperate need of reform. Kafala, moreover, is disliked not only by employees but also by many employers because it makes them liable for whatever the worker does during and outside of working hours. Mr. Stephens argues that authorities understand the need for change but are not giving it the priority required to stop further damage to Qatar’s reputation. Yet, at the same time, he concedes that conservative forces and at least some business circles oppose abolishing kafala. “Business interests are often the hindrance, and the young Emir, like his father will need to work hard to combat those companies, including many western entities that accept and propagate the system that stands against the interests of a majority of the country, local and foreign alike,” Mr. Stephens wrote referring to 33-year old Sheikh Tamim bin Khalifa Al Thani who became emir in June after his father, Sheikh Hamad bin Khalifa Al Thani, abdicated. A recent study by researchers of Weill Cornell Medical College in Qatar concluded that the cost of maintaining the labor system went beyond reputational damage. The researchers concluded that Qatar would be near the top of the United Nation’s Human Development Index (HDI) if adjustments were made for the country’s large population of migrant workers. With other words, the system undercuts Qatar’s soft power effort designed to project the Gulf state as a cutting edge, 21st century knowledge-based society. Turkish soccer pitches have reasserted themselves as political battlefields following the death of a protester and the emergence of pro-government football support groups in the wake of mass anti-government demonstrations in June. The revival of the soccer battlefield signals the initial failure of government attempts to regain political control of the pitch by imposing restrictions on political expression during matches, tacitly supporting pro-government support groups, legal actions against anti-government fans and a public affairs campaign that projects protest as a precursor of terrorism. Clashes during an Istanbul derby this weekend between rival fan groups as well as with the police cemented soccer’s role in Turkey’s political power struggles, fuelled suggestions that the government was employing its football support groups to create pretexts for further measures against Carsi, the militant left wing fan group of storied Istanbul club Besiktas JK and strengthened allegations that its rival Galatasaray FC may have played a murky role in a match-fixing scandal. 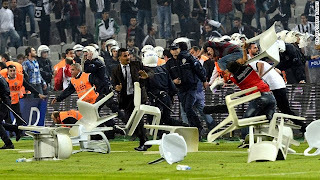 Police arrested 68 fans this weekend after supporters stormed the pitch during the extension of a home match between Besiktas and Galatasaray. The detainees were later released after being slapped with a one-year ban on attending soccer matches. The clashes erupted after a referee handed a red card to Galatasaray player Felipe Melo and ordered Besiktas coach Slaven Bilic off the field. In response, fans stormed the pitch. Members of 1453 Kartallari (1453 Eagles), a religious Galatasary support group named in commemoration of the year that Ottoman Sultan Fatih the Conqueror drove the Byzantines out of Constantinople, shouted ‘God is Great,’ and attacked Carsi supporters, who played a key role in the Gezi Park protests in June against Islamist prime minister Recep Tayyip Erdogan. 1453 is believed to have ties with Mr. Erdogan’s ruling Justice and Development Party (AKP). 1453 spokesman Fırat Aydınus denied that his group had links to the AKP, but conceded that none of its members were arrested in connection with the clashes. "These events were orchestrated. Melo is not the reason, he was only the means [of provocation]," Carsi said on Twitter. Opposition Republican People’s Party (CHP) deputy Sezgin Tannkulu has asked Mr. Erdogan to advise parliament whether his government was waging a campaign of intimidation against Carsi. The incident in Istanbul’s overcrowded Ataturk Olympic Stadium followed on the heels of last week’s anti-government protests in Kadikoy on the Asian side of Istanbul which is home to Fenerbahce, Turkey’s most popular club. Fenerbahce fans led the protests that were sparked by claims that a police tear-gas canister had killed 22-year-old Ahmet Atakan during demonstrations in early September in the southeastern city of Hatay. The clashes during the Besiktas Galatasaray match served to widen the gap between Besiktas’s pro-government management and its anti-government fans, 20 of which were indicted earlier on charges of being members of an illegal organization for their alleged role in the protests in June against government plans to replace Gezi Park on Istanbul’s iconic Taksim Square with a shopping mall. The 20 face up to 15 years in prison under Turkey’s draconic laws against organized crime. The government has denounced protesters, including members of Carsi who united rival soccer fan groups in confronting law enforcement. Interior minister Muammar Guler said the government would prosecute whoever had been caught on security cameras in the stadium. Deputy Prime Minister Bulent Arinc warned that "radical measures will have to be taken to ensure that such events do not occur again." The government last month banned the shouting of political slogans in stadia and ordered clubs to force spectators to sign a statement that they would abide by the ban. Soccer fans said the clubs had found it difficult to impose the signing of the pledge. Government plans to replace private security companies with police in stadia have been stalled by opposition by European soccer body UEFA and world soccer governor FIFA who are against an overbearing police presence in stadia. The government insisted however that plainclothes policemen would mingle with militant fans during matches and that their activities on social media would be monitored. Fans demonstratively violate the ban by chanting political slogans in the 34th minute of this season’s matches. Istanbul license plates start with 34. Critics charge that the ban targets opponents of Mr. Erdogan, a former semi-professional soccer player, who dons the scarf of Kasimpasa SK, the local Istanbul club in the neighborhood where the prime minister grew up, during pro-government rallies. Kasimpasa named its stadium after Mr. Erdogan. Mr. Erdogan often likes to address crowds in stadia which government officials argue does not violate the ban that applies only to matches, not to stadia in general. With its own stadium being renovated, Besiktas is playing in a twist of irony its home matches in Kasimpasa’ Recep Tayyip Erdogan Stadium. Carsi members unleashed a torrent of anti-government slogans in their opening match in the stadium, prompting state-owned and pro-government television channels to mute the sound of the protests. “We stand for fairness and justice. Nothing will stop us from upholding our principles,” said a Carsi member. The government’s restrictive measures were accompanied by a campaign by the Anti-Terrorism Office and the police warning that protests were the first step towards terrorism. They issued a 55-second video featuring a young woman demonstrator-turned suicide bomber warned the public that “our youth, who are the guarantors of our future, can start with small demonstrations of resistance that appear to be innocent, and after a short period of time, can engage without a blink in actions that may take the lives of dozens of innocent people.” Throughout the video, the words ‘before it is too late’ are displayed. Scores of fans believed to be members of 1453 scaled barricades and stadium walls to attend the Besiktas Galatasaray match. Recently amended Turkish Football Federation regulations bar supporters of a visiting team from entering the host stadium during a derby. “We have to learn that football is a game. When I came here and saw the crowd, I got goose bumps. Let’s turn football into a festival,” said TFF vice chairman Ufuk Ozerten after last weekend’s derby. Political scientist Dogu Ergil, speaking to Zaman newspaper that is owned by Mr. Erdogan’s Islamist rival, self-exiled preacher Fethullalh Gulen, said mounting tension on the pitch was the result of delays in deepening Turkish democracy. "Society is frustrated due to the arrested development of democracy, and frustration triggers violence. Since there are no other outlets to express one's frustration, this is what happens," Mr. Ergil said. He said successive governments, including that of Mr. Erdogan, approached democracy as a form of tutelage rather than a participatory system. "Whichever group dominates the state, it puts this system of tutelage to work. But democracy is a culture of compromise, and imposing one's opinions on others leads to frustration … Governments in Turkey are not here to govern but to give orders," Mr. Ergil said, pointing to the ban on political slogans in stadia. Mr. Ergil used Mr. Erdogan’s intervention last year to ensure that those implicated in a massive match fixing scandal that constituted the backdrop to a power struggle between the prime minister and Mr. Gulen would be treated leniently as an example. "There are no rules in Turkey. There is only [government] power. And things transpire the way they want them to,” Mr. Ergil said. Koray Caliskan, a political scientist at İstanbul's Bosporus University added that Mr. Erdogan defines democracy as a ‘ballotocracy,’ a system in which the winning party caters to its followers with no regard for other segments of society. “Erdogan criminalizes every act. He accused Kurds on a hunger strike of eating kebabs; he demeaned those who protested at Gezi as thugs. He treats legitimate and democratic protests as a crime. Non-political spheres are politicized as democracy weakens, People first take to the streets, and then when that is suppressed, to the stadiums," Mr. Caliskan said. A pending decision in early October by world soccer body FIFA on whether to move the Qatar 2022 World Cup from summer to winter threatens to open debate on whether to deprive the Gulf state of its right to host one of the world’s two largest sporting events and could spark allegations of an anti-Arab bias. The debate about the Qatari World Cup also focuses the spotlight on the incestuous relationship between politics and sports, a relationship that FIFA president Sepp Blatter in a rare acknowledgement, confirmed by charging that politics had prompted the eight European members of his 24-member executive committee to deliver eight of the 14 votes cast in favor of Qatar. The acknowledgement highlights the need to end denial of a fact of life and move to some form of governance of the relationship between sports and politics. The debates have intensified as the FIFA executive committee prepares to discuss on October 3 and 4 a shifting the Qatari World Cup to winter because of searing summer temperatures in the Gulf state that exceed 40 degrees Celsius could affect the health and performance of players. Arsene Wenger, the storied manager of British Premier League club Arsenal, in a reflection of opposition by European clubs to a change of date, urged FIFA to stand by its original decision about but expressed concern about the impact of extreme heat on fans rather than players. The debate about the timing of the tournament preempts a litmus test of cooling technology Qatar, the first Middle Eastern and Muslim state to be awarded World Cup hosting rights, says would make the holding the tournament in the summer feasible despite the heat. The technology which has been applied in small spaces is expected to be tested when Qatar completes in 2015/6 the first of up to nine stadia. Potential legal challenges to any change of debate as well as a row between Mr. Blatter and the head of UEFA, the European soccer body, Michel Platini, a potential challenger to Mr. Blatter’s presidency in FIFA’s next presidential election scheduled for 2015, risk strengthening calls for a change of venue. Mr. Platini has backed calls for a shift from summer to winter. Frank Lowy, head of the Australian Football Federation, one of several bidders defeated by Qatar, warned that a shift from summer to winter would be “tantamount to changing the rules after the contest is over." Mr. Lowy vowed to take legal action to reclaim taxpayers' money spent on the failed Australian bid would have been wasted if the federation had been campaign conducted under false pretenses. FIFA’s corporate sponsors as well as broadcasters who bought rights for billions of dollars potentially could also seek legal redress. Fox TV together with Spanish language broadcaster Telemundo paid $1 billion for US television rights, a sum far higher than what they would have paid the United States’ National Football League. The two tournaments could overlap if the timing of the World Cup is changed. Complicating the controversy over Qatar’s is Mr. Blatter’s assertion that European members of the FIFA executive committee had voted in favor of Qatar as a result of political pressure. In response, Mr. Platini, whose son is legal counsel for state-owned Qatar Sports Investments, became the first member to disclose that he had voted in favor of the Gulf state. Mr. Platini denied that his decision had been politically motivated. Mr. Platini’s denial rang hollow given that his vote is widely believed to have been part of a three-way deal with Nicolas Sarkozy when he was president of France and former Qatari emir Sheikh Hamad bin Khalifa Al Thani. As part of the deal QSI acquired Paris St. Germain (PSG), Mr. Sarkozy’s favorite team and pledged to step up already substantial investments in France. Qatar’s state-owned Al Jazeera television network would gaining rights to France’s Ligue 1 in another element of the deal that was forged over lunch at the Elysée Palace. In an interview with Al-Monitor, Qatar’s ambassador to France, Mohamed Al Kuwari, explained at the time Qatar’s interest in France by saying that “you invest in France, you build partnerships and you go elsewhere, to Africa, to Asia. We are looking for strong partners like Total, Vinci, Veolia.” Moreover, he said, France, like Qatar charts its own course internationally. It “has an independent policy, plays an important role in the world, diplomatically and politically,” he said. The World Cup so far has failed to pay Qatar the reputational dividend it had expected. Legal challenges and calls for depriving it of its hosting right could cause it further damage at a time that international trade unions and human rights groups are exploiting the tournament to pressure the Gulf state to substantially alter a migrant labor system they denounce as modern slavery. Foreign labor constitutes 94 percent of the Qatari labor force and a majority of the population. The risk of reputational damage and a rift over perceived anti-Arab and anti-Muslim bias is magnified in Qatar’s case by the fact that its sports investment strategy is key to its defense and security policy. Qatar, no matter how many sophisticated weapons it purchases, will never be able to defend itself. The 1990 Iraqi invasion of Kuwait taught it two lessons. For one, big brother Saudi Arabia, unable to ensure its own defense, was an unreliable guarantor that depends on a US defense umbrella. Confidence in the reliability of the United States has however been called into question by the United States’ economic problems, its reluctance to engage militarily post-Iraq and Afghanistan and its likely emergence within a decade as the world’s largest oil exporter. Equally important, the international coalition that came to Kuwait’s aid demonstrated that soft power and embedment in the global community at multiple levels earns one friends when in need. For Qatar, the message was clear. It vested its soft power in sports and particularly soccer even if it was a late convert to the beautiful game. Qataris first saw British oil workers in the 1940s play what they thought was an odd but amusing spectacle. “We had no idea of sports like that … But we used to enjoy watching the strange spectacle,” recalled Ibrahim al-Muhannadi, a government official and member of the Qatar Olympic Committee. Middle Eastern investors have adopted a new strategy of buying low and selling high with a series of acquisitions of second and third tier European soccer clubs. In the most recent acquisition, Saudi Prince Abdullah bin Mosaad, the billionaire former president of Saudi Arabia's most successful club Al Hilal and founder and chairman of the publicly-listed Saudi Paper Manufacturing Group, the largest paper tissue manufacturer in the Middle East, bought a 50 per cent stake in Sheffield United with the aim of helping the club graduate from the third league to England’s Premier League. "This is the best way to make profit if the club rises to League One and then the premiership," the prince, the first member of the Saudi ruling family to invest in a foreign soccer team, said. Prince Abdullah’s statement echoed earlier remarks by Bahraini investors who late last year bought storied second tier English club Leeds United for $82.5 million. GFH Capital was the first Islamic finance institution to acquire a European soccer club. Since acquiring the club less than a year ago, GFH Capital has sold more than half of its holding to other Middle Eastern investors. “I see Leeds as a sleeping giant and the more I am involved, the more I appreciate that. There were many clubs available for sale in the Championship, but Leeds have a different reputation and because of this potential that we were attracted,” said Salah Nooruddin, Bahrain-based businessman, who became chairman of Leeds after buying a 3.3 percent stake in the club from GFH Capital. GFH’s acquisition of Leeds initially raised questions because of the group’s mixed investment track record and negative experiences of other clubs such as Portsmouth SC, Swiss Super League club Servette FC, Austria’s Admira Wacker and Spain’s Malaga CF that have suffered from and at times seen their problems aggravated by acquisitions by Middle Eastern commoners or lesser members of ruling families whose takeovers proved to be whimsical rather than strategic. GHF’s close ties to the minority Sunni Muslim Bahraini ruling family that two years ago brutally crushed a popular uprising by the island’s majority Shia Muslim population raised questions whether the Leeds acquisition was partially intended to shore up Bahrain’s tarnished image. Human Rights Watch charged last month that the acquisition in 2010 of Manchester City by a senior member of the ruling family of the United Arab Emirates, who has proven to be a serious and committed investor, served to launder the country’s image. The acquisition of European clubs by nations with a record of suppressing opposition and violating human rights prompted former English Football Association chairman Lord Triesman to call for making a country’s human rights record one of the criteria for establishing whether a state entity or member of a ruling family passes the "fit and proper person test" for ownership of a Premier League club. Lord Triesman’s criteria would not apply to GFH which is not a state-owned entity. The focus on the UAE followed the mass trial this summer of 94 people of which 69 were sentenced to lengthy prison terms on charges of being members of the Muslim Brotherhood. Human rights activists condemned the trial as unfair and a violation of due process. They asserted that the defendants had been denied legal assistance while being held incommunicado, allegedly tortured and were not given the right to appeal. Responding to the criticism, the UAE justice ministry implicitly did not rule out torture, arguing that alleged victims should have reported abuse to the police. Qatar, which like the UAE has proven to be a solid investor because it too sees its soccer investments as strategic and key to the enhancement of its soft power in a bid to compensate for the fact that it will never have the military muscle to defend itself without external help, has learnt that reputational risk is the downside of involvement in soccer. Qatar’s winning of the right to host the 2022 World Cup remains controversial almost three years after world soccer body FIFA awarded it the tournament. Weeks before FIFA’s executive committee meets to decide whether to move the competition from summer to winter because of the Gulf state’s searing summer temperatures, Qatar finds itself fending off demands that it be deprived of its hosting rights. 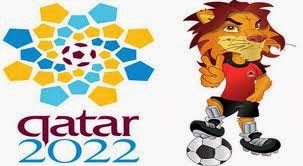 Qatar has been further in the firing line because of labor rights and questions about gay rights during the tournament. While Qatar has put itself in a class of its own by going beyond acquisitions to develop a fully-fledged sports sector and industry of its own, it too is looking at less flashy targets in Europe. After winning the World Cup hosting, purchasing Paris St. Germain, sponsoring Barcelona FC and acquiring rights to major leagues for its state-owned Al Jazeera television network, Qatar last year acquired Belgium’s second division KAS Eupen. The acquisition by Qatar's Aspire Zone Foundation (AZF) differs from those by Prince Abdullah and GFH Capital by virtue of the fact that it is part of a grander strategy designed to make the Gulf state a key node in world soccer. The acquisition is intended to further the sport academy’s Football Dreams program, which scouts potential talent among adolescents in developing African nations as well as Vietnam, Thailand, Guatemala and Paraguay. "We travel through these countries all year round with coaches and volunteers, organize matches, and provide the players with apparel. We then stage a final match in each country, with an international final held in Qatar," said ATZ director general Ivan Bravo. Mr. Bravo. Football Dreams graduates would be placed with Eupen. "Graduates will come to Doha and work with Qatari players. We wanted to do something that could help develop Qatari athletes. The idea is to find talented football players around the world that would help Qatari players become better players," Mr. Bravo said. Saudi Arabia’s secretive ruling family is mulling allowing women to attend soccer matches. No Saudi official has suggested that the controversial issue is under discussion but if past experience is any indication, a series of statements and denials suggests that a debate is underway. The debate would be a revival of closed door discussions that has been waged on and off for the past two years. Attempting to assess debates within the secretive family is not dissimilar to Kremlinology, the speculative science analysts developed in an effort to understand the inner workings of the Soviet leadership. Granting women sporting rights in the kingdom that in most parts of the world would be taken for granted takes on added significance with the Saudi Football Federation’s recent suggestion that the kingdom will compete against the United Arab Emirates, Bahrain, Oman, Kuwait, Thailand and Iran for the right to host the 2019 Asia Cup; hints that Saudi Arabia may field a serious candidate for next year’s election of a new head of the Asian Football Confederation (AFC) and the acquisition by Saudi Prince Abdullah bin Mosaad of a 50 percent stake in third tier English cub Sheffield United. The moves that would that would project Saudi Arabia on the global soccer map are not without risk as Qatar and Abu Dhabi have learnt the hard way. Qatar had expected to be cheered when it won the hosting rights for the 2022 World Cup, but has since had to deal with a barrage of criticism, negative publicity and demands that the tournament’s venue be moved. Recent improvements in the material conditions of foreign labor, who constitute a majority of the Gulf state’s population, are the result of a threat by international trade unions and human rights groups to boycott the World Cup and companies involved in the construction of infrastructure related to the tournament if Qatar fails to adhere to international labor standards. Human Rights Watch last month accused the UAE of using its ownership of English Premier League club Manchester City and move into the United States’ Major League Soccer to polish an image increasingly tarnished by autocratic and counterrevolutionary policies, including the recent sentencing of scores of dissidents on charges of plotting to overthrow the government and UAE support for the military coup that ousted Egyptian president Mohammed Morsi. A country that is developing its first national sports plan for men only; lacks physical education for girls in public schools; forces women’s soccer clubs to operate in a legal and social nether land; bans women from driving, travelling without authorization from a male relative and working in a host of professions; and when it was forced last year by the International Olympic Committee (IOC) to field women athletes chose two minor expatriates, Saudi Arabia is particularly vulnerable to criticism. In minor concessions, Saudi Arabia’s religious police said earlier this year that women would be allowed to ride bikes and motorbikes in recreational areas provided that they were properly dressed and accompanied by a male relative. Authorities also announced that they would allow girl’s physical education in private schools as long as it was in line with Islamic law. Saudi Football Federation (SFF) president Ahmed Eid Alharbi, a storied former goalkeeper who became the kingdom’s first elected sports official after his predecessor, a member of the ruling family, was forced under fan pressure to step down, has hinted at the economic impact of allowing women to attend soccer matches would have. He said earlier this year that the creation of facilities for women would increase capacity at stadiums by 15 percent. Alharbi said the Prince Abdullah Al-Faisal Stadium in Jeddah would be the first to accommodate up to 32,000 women followed by the King Abdullah City stadium in the capital in 2014. Saudi Arabia, which enforces strict gender segregation, first announced in 2012 plans to upgrade the Jeddah stadium to enable women to enter. Alharbi later qualified his remarks by saying that the decision to lift the ban on women was not his. “A decision like this is a sovereign decision. Neither I nor SAFF can make it. Only the political leadership in this country can make that decision,” he said. Prospects for women’s attendance were further thrown into doubt in the past week when Prince Nawaf bin Faisal, the head of the youth welfare authority who resigned as head of the national soccer body, and the SFF denied that women would be granted access to the King Fahad Stadium in Riyadh during last week’s friendly against New Zealand. The denial was issued after the stadium’s manager, Sulaiman al-Yousef, manager of King Fahad Stadium, announced that foreign women and children would be permitted to watch the match. A picture on the website of the Saudi-owned Al Arabiya television network of a few women and children in the stadium appeared to counter the denial. The debate about women’s access to soccer matches is being waged against the backdrop of a series of anti-government incidents in the wake of last year’s resignation of Prince Nawaf. A Facebook page entitled Nasrawi Revolution demanded the resignation of Prince Faisal bin Turki, the owner of storied Riyadh club Al Nasser FC and a burly nephew of King Abdullah who sports a mustache and chin hair. A You Tube video captured Prince Faisal seemingly being pelted and chanted against as he rushed off the soccer pitch after rudely shoving a security official aside. “Everything is upside down. Revolution is possible. There is change, but it is slow. It has to be fast. Nobody knows what will happen,” said a Saudi sports journalist referring to broader discontent in the kingdom that goes far beyond soccer. · Foster a global network of like-minded professional schools. other countries in the region. well as adopt the best practices of successful schools. accommodate alternative lifestyles or religious practices. and elevate it to a potentially serious threat. stark as it is now, at a time of massive change in the region. leaders, Egypt being one of the first and foremost. opposed to embattled Syrian leader Bashar al-Assad. the founder of Islam’s most puritan sect. 22 years after achieving independence. among more conservative segments of Qatari society. popular uprising in its own backyard. economically. Egyptians in Qatar moreover are only a minority. others may take.” the monarch said. Egyptian military leader General Abdel Fattah Al-Sisi to Assad. fighting as part of a jihadist rebel group. they have a crisis, they come close to God. This is the nature of man. North Africa in demand of civil, human and political rights. March 2013 against ignoring widespread public discontent. region’s trend and maintaining close ties to the Brotherhood. that represent its Shiite Muslim majority. minister and prominent lawyer Najeeb al Nauimi. for Qatar’s early backing of opponents to Syrian president Assad. 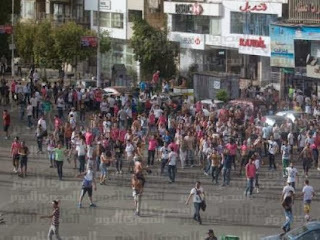 between Egypt and Syria put Syria in protesters’ firing line. more radical bloc in the Arab world. clerics of Saudi Arabia were more mature than me." 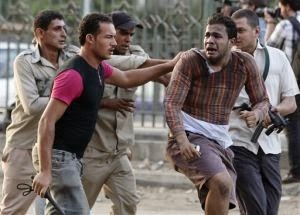 revolt in 2011 that toppled Egyptian President Hosni Mubarak. the state and segments of the civil society,” Shambayati wrote. an Arabic speaking audience of 60 million. which involved Saudi’s guarantee to protect the tiny emirate. as a cutting-edge, moderate, knowledge-based nation. incapacitated them not only physically but also mentally. of his father’s foreign policy. "We have received no clearance from Saudi Arabia. be finally completed in 2008.
with other Saudi nemeses such as Israel and Hezbollah. questions about what it is trying to achieve. movement and its emergence as a mediator in Yemen. political and criminal purposes are a fixture of life. president’s own tribe, the Hashid tribal confederation. popular uprising against him and joined the opposition. powerful advisor to President Abed Rabbo Mansour Hadi.